In this two-part Photoshop photo effects tutorial, we'll learn how to create a fun photo collage using a simple film strip shape as a photo frame for multiple images. In this first part of the tutorial, we'll draw the actual film strip itself using Photoshop's shape tools, then we'll save it as a separate document so we can easily re-use it any time we want without having to draw it all over again. In the second part of the tutorial, we'll use several copies of the film strip to create our photo collage. The film strip shape which will be used as a photo frame in the collage. Go to File > New to create a new Photoshop document. Create a new 1000 x 900 pixel document. When you're done, click OK in the top right corner of the dialog box to exit out of it. Your new document window will appear on your screen. Press "D" on your keyboard to quickly reset the Foreground and Background colors. Choose between vector shapes (left), paths (middle) or pixel-based shapes (right) with the three icons in the Options Bar. Click near the top left corner of the document, then drag towards the bottom right corner. Photoshop draws the shape and fills it with black when you release your mouse button. Shapes automatically appear on their own layers in the Layers panel. Click on the "Subtract From Shape Area" option in the Options Bar to select it. Draw another rectangular shape in the middle of the initial shape. The main photo area of the film strip has been created. Select the Rounded Rectangle Tool from the Options Bar. Set the Radius value to 10 px. Draw a small rounded rectangle shape on the left side of the top black border area. Once again, Photoshop uses the new shape to knock out a section of the initial shape. Select the Path Selection Tool. Click inside the notch with the Path Selection Tool to select the shape. A second notch appears at the top of the film strip. Drag out six more copies of the shape for a total of eight notches along the top. Hold down Shift and click on each notch with the Path Selection Tool until you have them all selected. The Options Bar contains various options for aligning the shapes. Click on the Distribute Horizontal Centers icon. The Distribute Horizontal Centers option spaces the shapes evenly between the shape on the far left and the shape on the far right. Hold Shift+Alt (Win) / Shift+Option (Mac) and drag the top row of notch shapes down to the bottom row, creating a copy of the shapes as you drag. Creating the row of notches along the bottom of the film strip is simply a matter of copying the top row and dragging it down to the bottom. Click on the vector mask thumbnail to deselect the shape. Click on the Layer Styles icon and select Drop Shadow from the list. The shadow is used to give the film strip some depth. Click and hold on the Rounded Rectangle Tool in the Tools panel, then select the Rectangle Tool from the fly-out menu. Click on the color swatch to set a color for the shape. 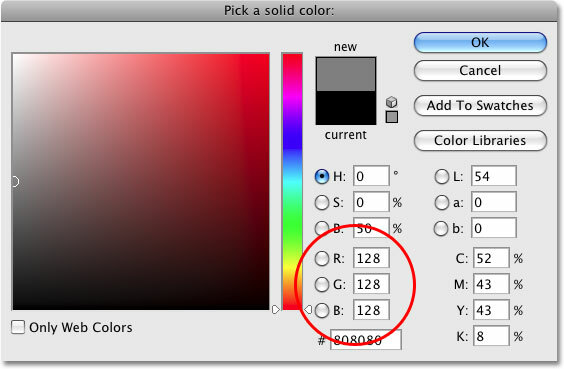 Set the R (Red), G (Green) and B (Blue) values to 128 in the Color Picker. Draw a second rectangle just slightly larger than the photo area. The main photo area is now covered by the second shape. Click on the word "Effects" and drag it down on to the Trash Bin to delete the drop shadow. Click and drag the second shape between the Background layer and the film strip layer. The gray shape now appears between the Background layer and the film strip layer. The final film strip, ready to be used as a photo frame and in our photo collage. Name the file and save it as a Photoshop document. We've now successfully created and saved our film strip shape, and it's ready to be used as a photo frame in our collage, which is exactly what we'll be creating in part two of the tutorial!